I receive a lot of traffic to my website due to your Dragonfly design. If there is any information you wish to share with the modelers, I'd be happy to add it. I once had a youtube video of a double size DF with a 4-stroke but that video was taken off of youtube. Oh, the Dragonfly. It has been a good friend for over forty years now. Sadly the 12'er was lost due to radio failure. It was cruising majestically at one half throttle then went to full throttle, full left rudder and full up elevator and spun into the top of a Douglas fir tree. Since the wing and tail ribs were 1/8 sq. balsa trusses they just exploded. The engine mount broke and the engine fell to the base of the tree. Pieces floated down for a long time but the fuselage was undamaged and stayed safely in the top of the tree. One of my grandsons climbed up and dropped the fuselage down. 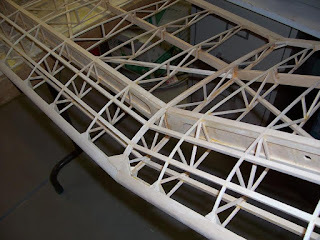 It came down and just broke one side of the landing gear dowel, it has been repaired and new wing ribs have been built. My friend Lynn Jost bought new covering material, hopefully it will fly again. As I recall there was another 12'er built somewhere in California back in the early 1990s and was powered with a two stroke engine, a .60 as I recall. There is a mention somewhere in a Model Builder issue from that time. As the magazine article says, the Dragonfly was designed by Bob Lee, a long time friend and myself after a discussion about a small rubber model. That model was The Ross Flyer by Clark Ross from a Sig Air Modeller Magazine published for a short time in the 1960's. Bob and I built many of those delightful little planes and flew them on quiet late evenings under the corner street light. Bob Lee and I built the first two as rudder only planes powered with Davie Charlton .047 diesel engines. A third one was built by another long time friend Bob Von Konsky. Then two local high school boys I was teaching model building and flying built the version published in Model Builder, powered with O.S. .10 engines and using rudder and elevator. Bob Lee lost his first one when he flew it with a Control Aire Galloping Ghost system. Bob Von Konsky's was eventually given to a young boy for a first trainer. Mine, which was the first one to fly (by a week), is still in my attic. I changed the engine to an O.S. .10 and continued to fly it rudder only until 1993 when I finally built a new fuselage and tail assembly and added elevator control. Sadly we lost Bob Lee to cancer in 1992. His older son gave me a Astro Flite 05 geared electric motor from his Dad's stuff. I built an electric version in 1999. Due to the 1 lb. weight of ni-cad batteries the wing was stretched an adfditional 12" to seven feet. The motor long since died but that one flies very well with an E-Flite Park 480 and a li-po battery. I could write stories about Dragonflys the rest of the day. At my friend Lynn Jost's urging I have develop several of the variations that have been soaring around in the back of my mind ever since the first one flew. 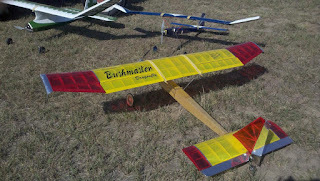 They include the Super Dragonfly with ailerons, the Bushmaster with great big flaps, the loadmaster that carries three and a half pounds of candy and drops it at club picnics and summer camps and can be flown as a single engine, a twin or a tri-motor. There is a flying boat twin that looks a lot like a PBY Catalina with an open cockpit when it flies by. The latest is a HotRod called The Dragonfly XP. It has fully symmetrical airfoils, powered with an E-Flite Power 25 and here at seal level is 3D. There are still at least two variants floating around in my aging mind. Maybe they will come to life yet. There have been Dragonflys built in several sizes. 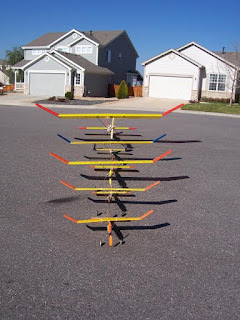 The first small one was a 4' span with a Cox Tee Dee and an Ace Pulse Proportional rudder only system built for my 8 year old son so many years ago. It still lives and was last flown about ten years ago. The best smaller size seems to be 60% at 42 " span. The standard Dragonfly, Super Dragonfly, Bushmaster and the XP have all been built in that size. I have a 36" span version EP 3 ch. That was taken as carry-on luggage when my wife and I flew to the east coast on vacation several years ago. I stood at the Wright Bros First flight Memorial marker and flew it three times down the course they flew, but the little Dragonfly was able to turn around and fly back, what a thrill! How the plane got into Model Builder is another great story. Another day. We lived in San Jose, California, down at the south end of San Francisco Bay when the Dragonfly was first built. Our home was in a new tract being built. We were the third house from the end of the street, I could take off up the street and climb over the still open field and then come back over the house. In the afternoon the wind blew down the bay and over a big hill just north of the house. There would be a secondary wave above the street that intersected ours. The little diesel would run for seven minutes on a tankful and then I could ride the wave for an hour or more. I would take a lawn chair and sit in the driveway and often my wife would bring me a Coke and a bowl of ice cream while the bird soared about 400 feet overhead. One afternoon I was sitting in the chair flying when a police car came slowly up the street. The officer looked alternately at me then out the window and up at the sky. He nosed the cruiser into my driveway and got out. He asked "what are you doing?" 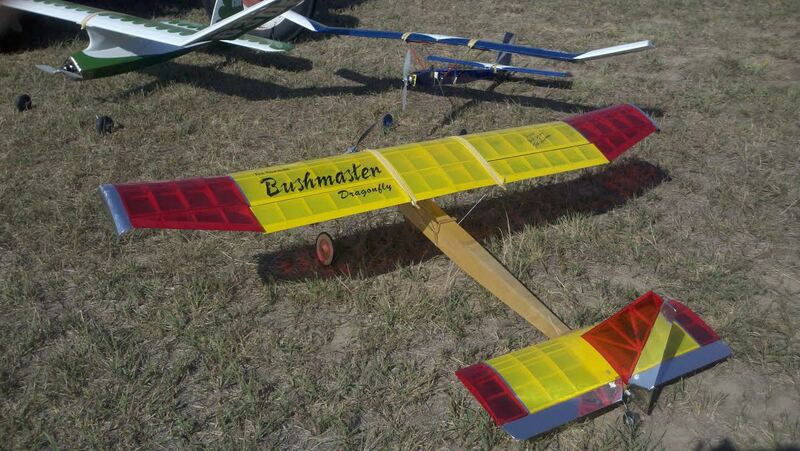 "Flying a model airplane" I answered. Having been run off several flying fields over the years, I thought I knew what was coming. "Where is it?" the officer asked. I pointed it out and then he said, "I have always wanted to try that." "Here!" I said as I handed him the transmitter, "This stick controls the rudder, just fly up and down in line with the street and always turn into the wind." He happily took the transmitter and did a very good job of flying, obviously enjoying the experience. He then said, "Well, I hate to do this . . ." my heart sank, this would be the end of a fun flying site, "but I have to get back to work", he continued, "have a good day." Attached is a picture of the Bushmaster variant, several Dragonflies from a 2' Co2 powered to the 12" and the wing of the 12" one.